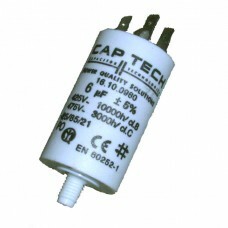 6, 7, or 8 Microfarrod capacitor suits Hoover and Fisher & Paykel dryers as well as Omega/Smeg dishwashers. 5uf capacitor suits Electrolux dryers. 6uf suits: Hoover/ Simpson D6776, 5015D, 5020D, 5025D, D6786, D6788, D6790, D6792, D6794, D6808, D6940, A6274, A6232, 5040EDB*02, 5040EDB*02, 5050EDB*02, K505EDB*02, 5050EDB*02, K505EDB*02, 3525DB*02, 3525DB*02, 3530DB*02, 3530DB*02, 5030DB*02, 5030DB*02, K352DB*02, K352DB*02, K503DB*02, K503DB*02, 5040EDD*00, 5050EDD*00, 3525DD*00, 3530DD*00, 5030DD*00, 5040EDB*01, 5050EDB*01, K5050EDB*01, 5040EDB*01, 5050EDB*01, K5050EDB*01, 3525DB*01, 3530DB*01, 5030DB*01, K352DB*01, K503DB*01, 3525DB*01, 3530DB*01, 5030DB*01, K352DB*01, K503DB*01, A6274, A6232. 7uf suits fisher and paykel: AD39, AD55, ED56.